Debate Takeaway: Little Daylight Between Obama, Romney : It's All Politics Other takeaways from the debate that was ostensibly about foreign policy: domestic issues; Obama on the attack; a strong but calm Romney; and an appeal to the base. Republican presidential nominee Mitt Romney and President Obama shake hands with audience members following the third presidential debate Monday at Lynn University in Boca Raton, Fla. In at least one sense, the final presidential debate of the year looked a lot like the previous ones between Mitt Romney and President Obama. Regardless of what they were asked, each offered talking points he had prepared and was determined to make. The candidates, not moderator Bob Schieffer of CBS News, set both the tone and the pace of the debate. That included switching gears far from the nominal subject of Monday's debate in Boca Raton, Fla., which was foreign policy. The domestic economy received at least as much attention and verbiage as Iran, Libya or China. 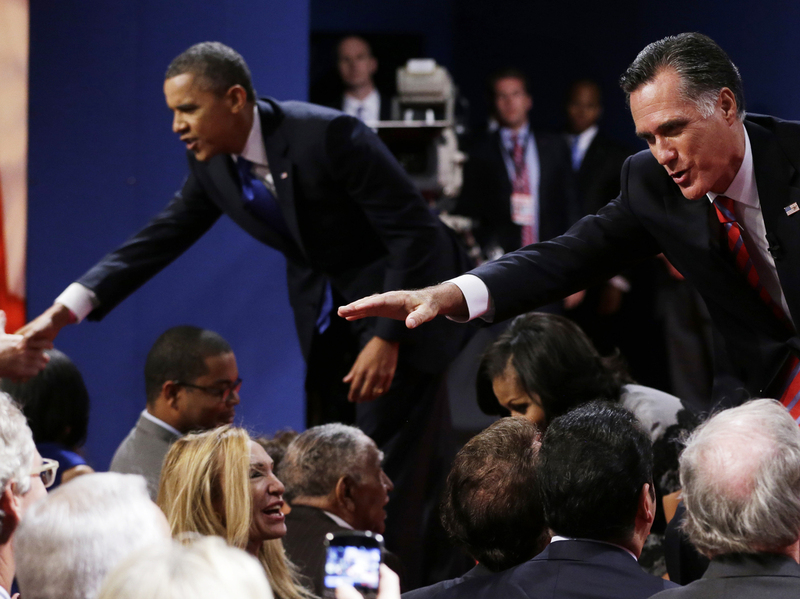 This debate did not look like last week's town hall-style confrontation, when Obama and Romney circled each other like a couple of caged panthers. Monday's tabletop discussion did not allow for the same type of overt finger-pointing. Still, both men were frequently on the attack. The president especially, perhaps still seeking to make up for his lackadaisical performance in his first debate with Romney, was consistently critical of his opponent. Obama had some barbs ready. After Romney repeated his frequent complaint that the U.S. Navy now has its fewest ships since World War I, Obama got off a line that launched the trendiest meme of the night: "Well, governor, we also have fewer horses and bayonets, because the nature of our military's changed." At times, the president's tone seemed to verge on sarcasm. On a pair of occasions, Romney said, "Attacking me is not an agenda," arguing any political points the president scored would do nothing to address challenges in the Middle East or increase trade. Romney, the former governor of Massachusetts, got off several tough lines against the president's record. He said that nowhere in the world has America's influence grown on Obama's watch. "What we've seen over the last four years is something I don't want to see over the next four years," Romney said. Still, Romney expressed agreement with Obama administration policies nearly as often as he disdained them. At one point he began an answer by saying, "I want to underscore the same point the president made ..." He passed on the chance to attack Obama once again, as he's done repeatedly over the past month, for the killings of four Americans at the U.S. Consulate in Benghazi, Libya. Romney instead congratulated the president for killing Osama bin Laden and sought to "underscore" his agreement with at least some current policies with regard to Afghanistan, Syria and Iran. Rather than accepting compliments where he could get them, Obama essentially accused Romney of being a flip-flopper and having shifted his positions. Romney's strategy may not have been to stay sharply on the attack. In general, he sought to project an image of strong leadership without coming across as bellicose. Obama may have alluded to the long wars started under President George W. Bush, but Romney sought to reassure Americans that he had little interest in fresh military engagements abroad. "We don't want to get drawn into a military conflict," Romney said about Syria. And, speaking of the Middle East in general, he said, "We can't kill our way out of this mess." Still, Romney's message was hardly that of a pacifist. He warned about ways in which U.S. stature could be diminished if defense spending is cut, or if the domestic economy is not healed. Did Someone Say This Was A Foreign Policy Debate? The U.S. economy seemed as much on the candidates' minds as any foreign challenge. After Schieffer asked them to define America's role in the world, they launched into a discussion about domestic issues that at one point led to a disagreement about whether Romney deserved credit for school funding levels in Massachusetts. They also argued about the revival of the domestic auto industry and Medicaid. Many of their lines during such seeming digressions had the ring of familiarity to those who had watched the first two debates. Obama accused Romney of having invested personally in questionable Chinese companies, while Romney said Obama had made a mistake in seeking to pick winners by investing government dollars in individual companies, such as the failed solar company Solyndra. Commentary on Twitter and television networks suggested that partisans in both camps believed their own champion got the better of most exchanges during the debate. It's not clear which foreign policy issues would prove decisive at this point to the few remaining undecided voters. But each man tried to present himself as, overall, the more attractive choice. Obama warned that Romney would lead the country back toward Bush-era policies that led to recession and long wars in Afghanistan and Iraq. "Governor, when it comes to our foreign policy, you seem to want to import the foreign policies of the 1980s, just like the social policies of the 1950s and the economic policies of the 1920s," Obama said early in the debate. Toward its end, Romney said, "I couldn't agree more about going forward, but I certainly don't want to go back to the policies of the last four years," blaming Obama for falling incomes and unemployment. "It's just a tragedy in a nation so prosperous as ours that these last four years have been so hard," Romney said. In short, each candidates continued with his campaign's overall game plan of making his opponent seem unacceptable.